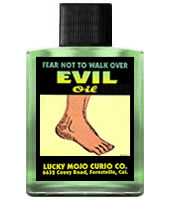 Fear Not To Walk Over Evil Oil is used to dress candles and also to oil the soles of your feet if you will be walking into a spiritually dangerous or unclean situation where an enemy may have laid tricks or thrown some kind of mess for you to walk in. Someone has left 3 shinny pennies heads up in a semi circle outside my mothers door on a table top. At first I did not think anything of it and left the pennies there, until my mother became ill. I am not sure if this is evil that has been placed there and need direction on how to proceed going ahead. The pennies are still there and I though it was best to seek your advice before I remove them. There's no way for us on the forum to know what those pennies represent. Either someone was casually playing around with them and left them behind, or else they are part of something intentional, or any other number of reasons. If you want to be sure to dispose of them properly, spray them with ammonia or (if yu have it) Florida Water or Jinx Killer bath crystals dissolved in water. Any of these can remove any negative energy that may be attached to the pennies. Thank you very much for your response. I will play it safe and use the Florida water and then throw them into the ocean.